The journey started off in the 90´s and restarted in 2007. At first they were four and New Wave was almost over. They tried hard but as you might guess, trying is never enough. They spent the next decade doing nothing. Well almost. But anyway not what they should have done. Music. Three years ago they hooked up again. As a duo. And decided to put our name on a record. Guitar and bass were always part of our sound. But now they combine them with machines. They like different styles of music. And want to share the first 11 of our songs with you. So if you like them let us know. They want to be loved. 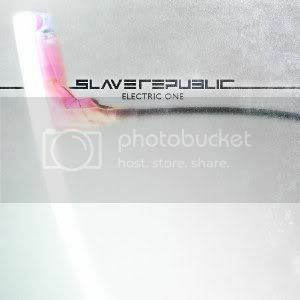 And maybe with their debut album “Electric One” Slave Republic is coming a little closer to that. The album is totally bright, Even the text is in white, only that the letters are highlighted in black. Interesting is, that you can only find the lyrics to “Less Of Me” and “The Driver” in the booklet, as well as the band biography, the credits and of course the thank yous. You can also find a picture of the duo in the middle of the booklet. The music on the album is mostly danceable and very suitable for the clubs. Some songs are slower though. On “Number Three” you can also hear female support vocals. “My Maker” is very catchy whereas “Less Of Me” is much slower. “Minimum Regret” sounds very harsh and definitely gets you dance along. “(I’m Your) Slave” is slower as well. The last two songs are great remixes you should definitely check out as well.